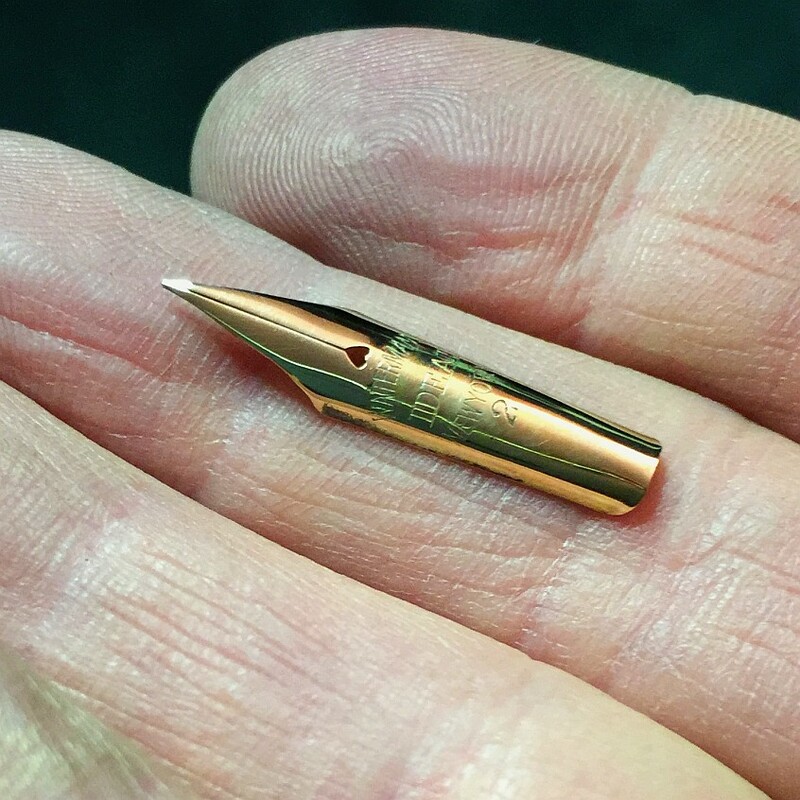 This is a Parker Sonnet on my workbench for some nib work. Notice the corrosion to the trim ring that has caused the gold plating to be lost. Folks, I don’t want to insult anyone, but it is a disgraceful engineering decision to succumb to a superficial desire for a bit of flash and as a result trade off durability. 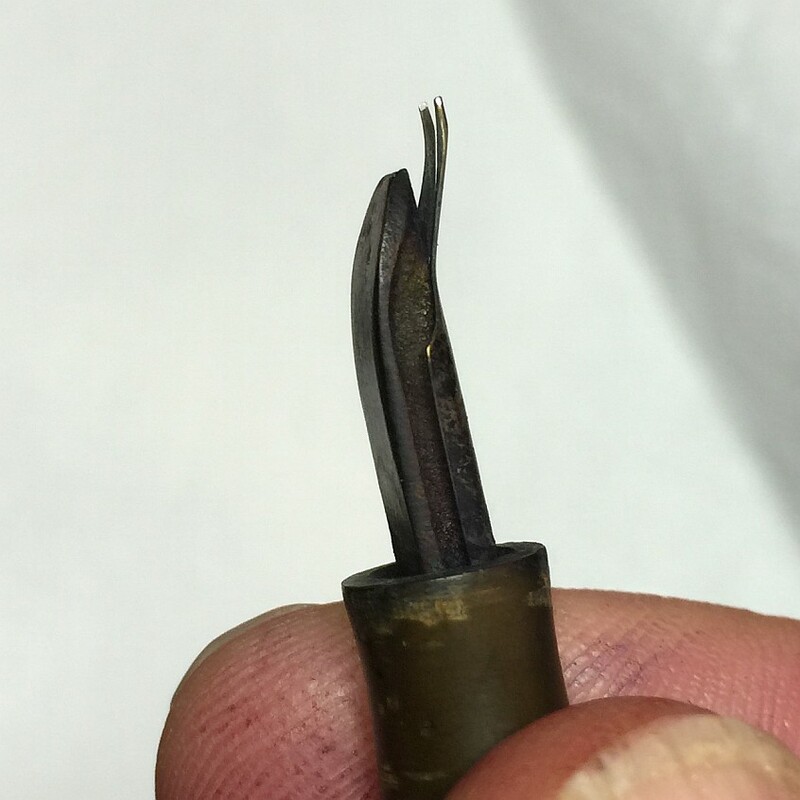 There’s a reason that for a hundred years, no quality fountain pen had a plated trim ring located at the front of the gripping section where the base metal would unstoppably fall victim to chemical attack from ink. Not until a later version of the Parker 75 did such a “feature” appear on a quality fountain pen, to my knowledge (think about it). The change to the 75 I consider a simple misjudgment, but on modern pens, where the lesson has long been known, it is inexcusable. Pens made this way are embodiments of pen manufacturers saying to their customers, “you don’t know or care about true quality, so we will ply you with snazzy aesthetics even though these expensive pens are doomed.” And they are doomed — all of them. Doomed. Really. Don’t buy pens with plated trim rings just behind the nib. I don’t care if they cost $1,000. They’re not really writing instruments at all. They’re pocket decoration. If I were shopping for a modern pen, I’d be insulted that manufacturers think I’m so superficial as to be taken in by shiny stuff at the expense of truly engineered durability. P. S. A few years after selling you that expensive, doomed pen, the manufacturer will likely no longer have replacement parts. This ain’t the 1970s, when Sheaffer was still servicing pens from the 1930s. I read a post on a popular pen forum about a purchase of a Sheaffer Snorkel with a rare flexible fine nib. Sadly, the pen was poorly packed, and it arrived with that wonderful nib badly bent and unusable. 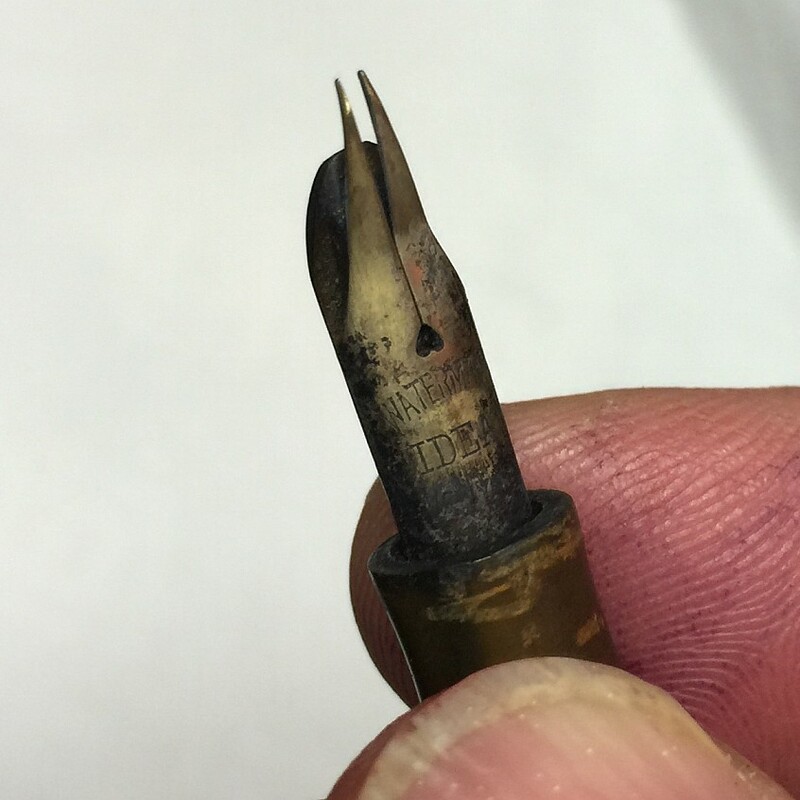 I offered to repair it; though there are several restorers who can do this type of work well, only a few of them can also restore the two-tone appearance of the nib after the repair is complete (working on such a nib invariably mars the plating on the forepart). The disappointed owner sent it in. 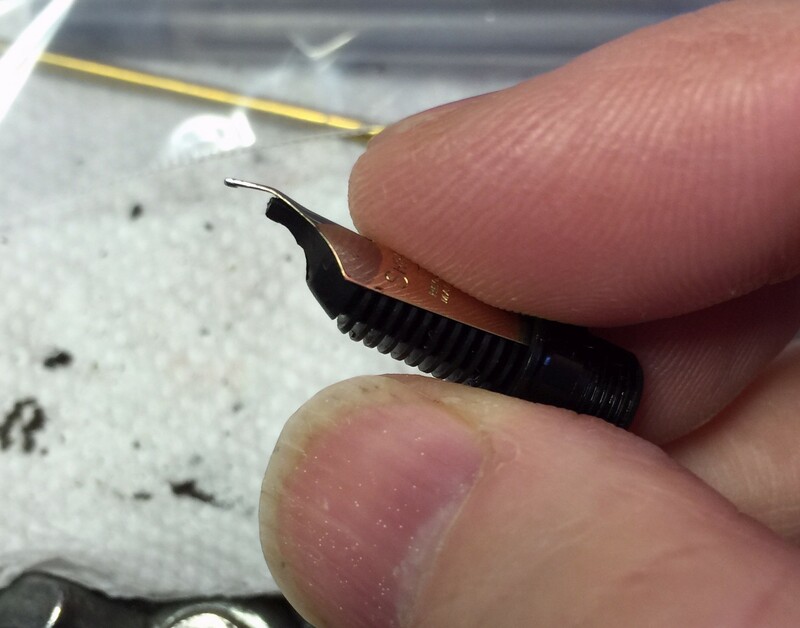 I also smoothed the nib to ensure the best writing experience I could provide. On a recent episode of “Gold Rush,” the television reality series about gold miners in the Klondike, the owner of a dredge that resembles nothing so much as a giant mechanical dirt-eating dinosaur is frustrated by the paltry extraction of gold from the thousands of yards of paydirt that is being devoured by the machine. He examines the tailings — the processed rock that is ejected after the various tumbling and washing operations have attempted to extract the gold — and he quickly discovers that there is still some of the precious metal clinging to the waste material. Improvements are made to the rig — additional water sprayers and agitation (“grouser”) bars are installed — and the next “cleanout” yields much more gold. The lesson is that sometimes, it’s worth going over material already examined to see if something of value was missed. Such was the case today, when I decided once again to look into L. E. Waterman’s employment history in the early 1880s. In Blotting Out the Truth, we had conclusively established that Waterman had been the Corresponding Editor of the periodical National Car Builder from January, 1881 through August, 1882; that proof came in the form of his name on the masthead of the publication every month throughout that time period. We had read reports that prior to that stint, he had held a similar post at another train publication entitled Railroad Gazette, but we did not have primary source evidence. David Nishimura pointed out that in testimony Waterman gave at one of the Wirt trials just a few years later, Waterman had stated that he had indeed worked at the Gazette before moving to National Car Builder; that was quite strong evidence, but given the mythology that we know can be created in this realm, we still couldn’t consider it absolute proof, a later endorsement for the Waterman pen by an editor at the Gazette notwithstanding. I don’t do much nib work. There are several reasons for this, but I’d say the slow pace at which I work limits the number of nib jobs I can do at a reasonable cost. 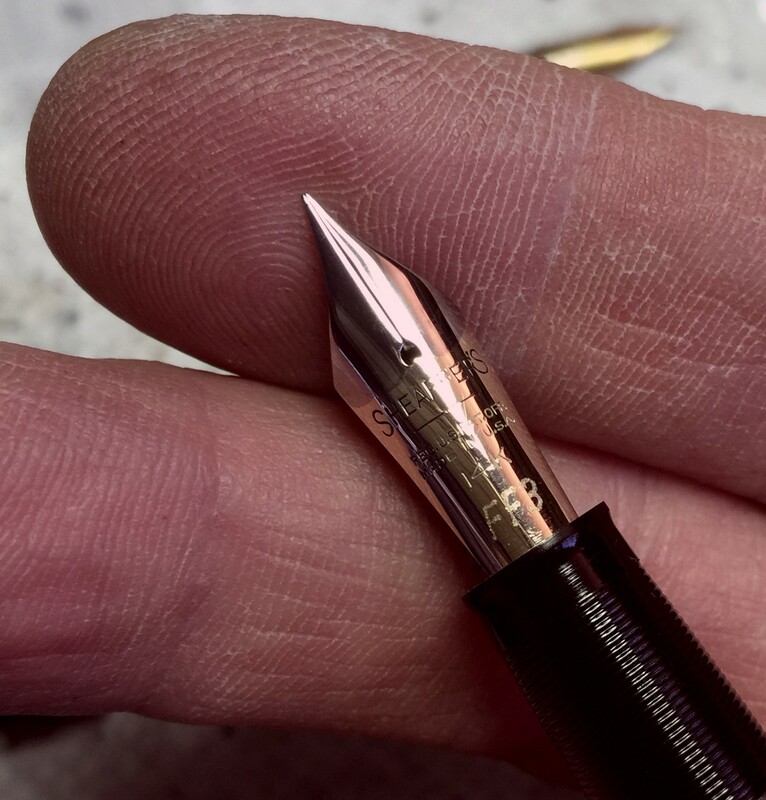 I just can’t speed through restoration tasks; I’m not comfortable working against the clock on projects for which patience and contemplation are important ingredients, and I also like to take my time when creating something – and I consider re-creating the original state of a nib (or cap, or whole pen) to be forms of creation. This nib is my own, purchased in a decrepit Waterman black hard rubber 52. 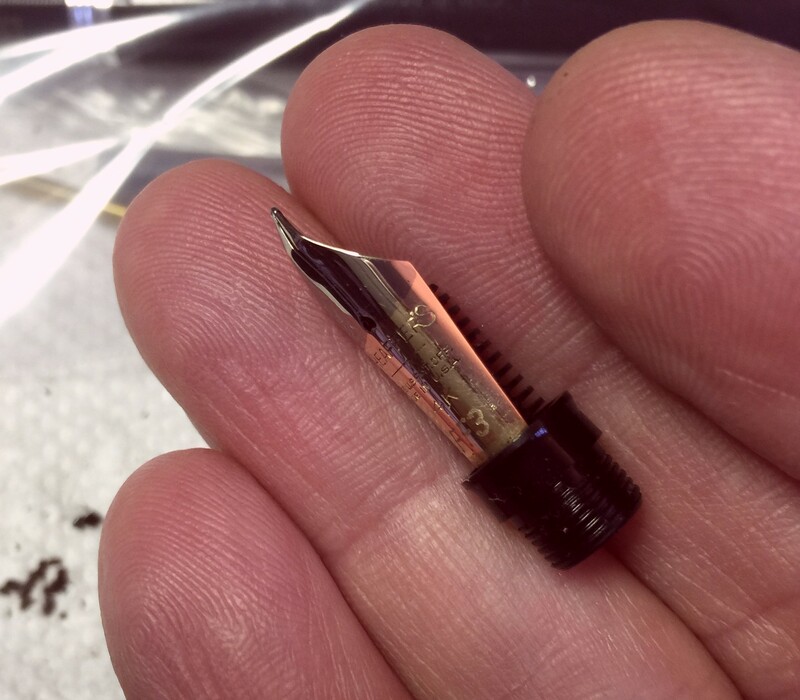 I saw potential in the nib, and I also was interested in the challenge of trying to resuscitate what looked like a sensitive nib that had been mortally wounded. 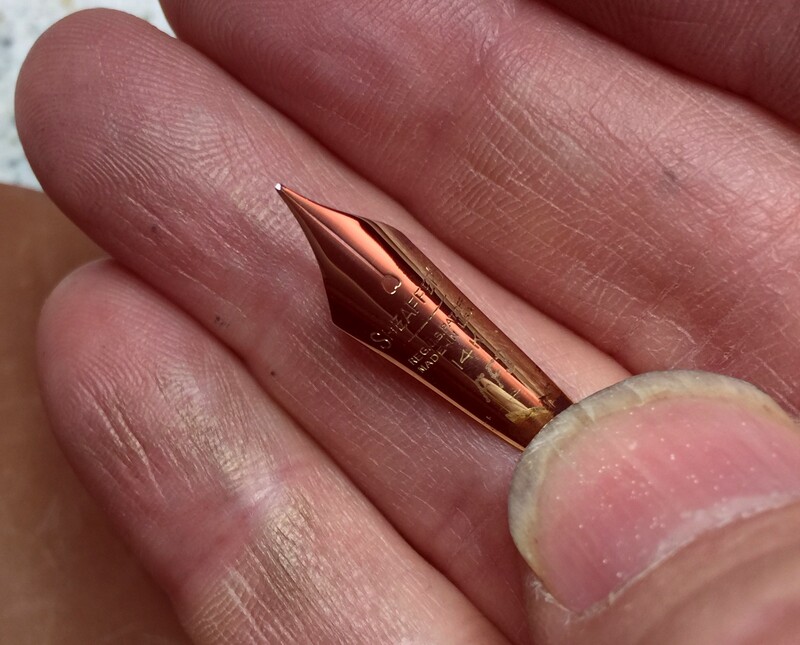 Though I have repaired far fewer nibs than metal caps, my skills with reversing deformed metal do give me a good base for many aspects of nib work. 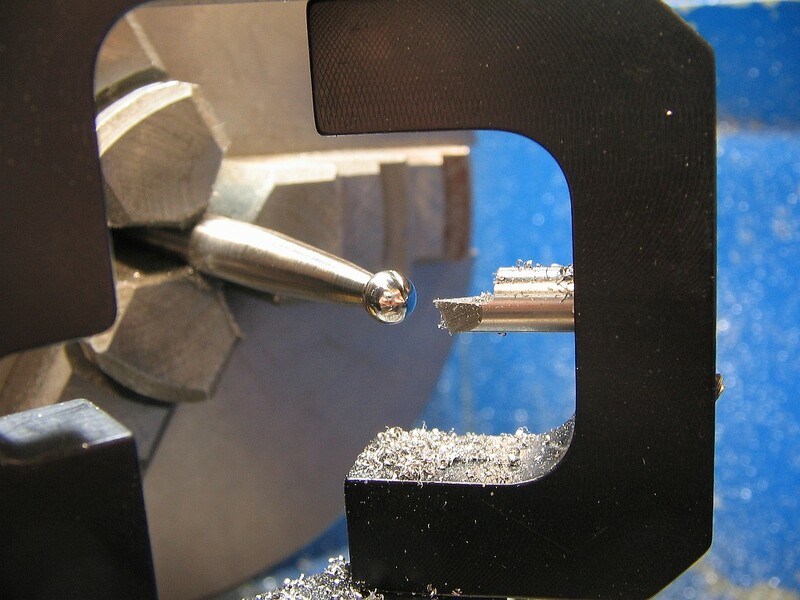 I have a feeling for the way metal responds to various manipulations, and just as with reversing cap dents, there are actually many distinct metalworking techniques that can be used to fix mangled nibs. Today I’m offering an unusual pen. The Marker-Ingram was made for only a few hours at the beginning of April, 1911, and it employed a filling system that was doomed from the start. The so-called “centrifugal loader” required wedging the pen’s section into the mouth of a special ink bottle, and this assemblage was then fitted into a sling-like apparatus with a long leather strap the end of which the user grasped. Then, with a rodeo-cowboy-like action, the user spun this arrangement either overhead or away from the body, whereby the forces of nature would compel the ink to flow into the pen, and, quite likely, to create a projectile of untold lethality and considerable messiness. SOLD $90, unrestored. Insurance not included. Liability insurance, that is.